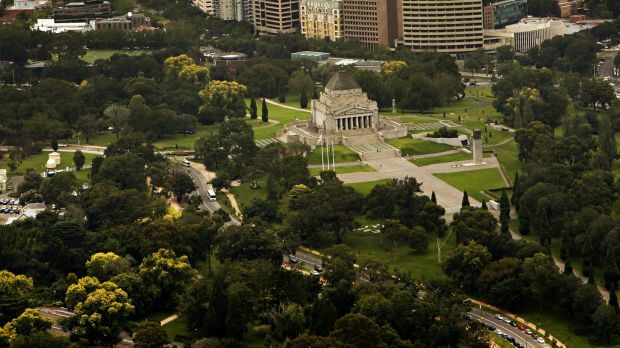 According to the environmental effects statement, about 900 trees could be removed along the tunnel route – including up to 223 trees in the precinct surrounding the Shrine of Remembrance, where a new underground station will be built. This would result in “a high residual impact” on St Kilda Road, which is lined with plane trees and elms – many planted in the late 19th century – and is one of “Victoria’s most significant landscapes”. “Construction of the proposed Domain Station would require full clearance of a defined area, including extensive tree removal for the establishment of the construction work site and station box, and removal of the existing tram stop and other infrastructure,” the documents say. Residents say it is not clear how many trees will be returned, whether they will be replaced by the same species, or how long this could take given the Metro rail project – a nine-kilometre twin tunnel between South Yarra and South Kensington – won’t be complete until 2026. “This boulevard that we have in Melbourne is often regarded as one of the finest of its kind,” said Fraser Read-Smith, who lives on Albert Road and is part of a residents’ group, G12, which represents people in 12 apartment blocks around the area. News of the environmental impact comes only days after the government awarded the first major contract for the project: a $324 million package for construction company John Holland to begin preparatory work next year on three massive shafts for the CBD North station at Franklin and A’Beckett streets, and CBD South beneath the city square. Obstructed views around the Shrine and residential apartments on St Kilda Road and Albert Road. Moderate to high visual impacts for recreational users of J.J. Holland Park, University Square, Queen Victoria Gardens and Fawkner Park. Dust particles, less foot traffic and reduced customer access for city businesses. Residents potentially needing to relocate temporarily if “unavoidable” after-hours construction causes too much noise and vibration.